Chop all your vegetables and add all ingredients (besides broth) to the crockpot. Pour broth on top of all ingredients, allowing the spices to get mixed into the dish. Give it a good stir. Set your crockpot on low for 6 hours or so. 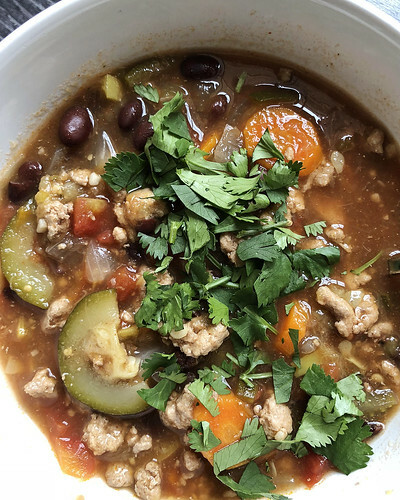 Ladle into bowls and add toppings of choice (she chose nutritional yeast and avocado, but suggests cheese, cilantro, Greek yogurt, sour cream, or tortilla chips). Enjoy! If made according to these instructions (for 5 servings pre-toppings), each serving will contain 174 calories, 3g fat, 21g carbs, and 17g protein. 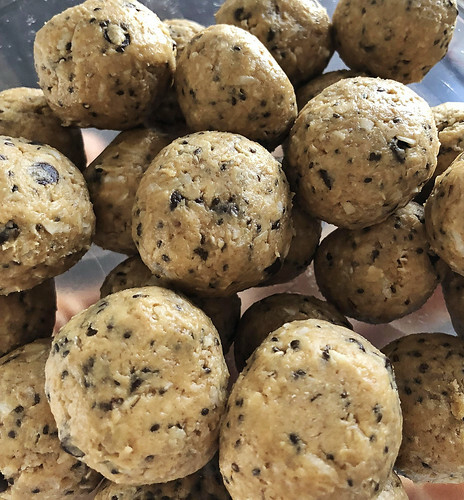 I've been browsing a lot of clean and healthy eating sites recently, probably like everyone else who is trying to start the new year off with a healthy bang, and have come across many variations of powerballs. I decided to try this recipe from Clean Eats and Treats for my first go and was really happy with how they came out. I've adjusted them a bit since and have put the changes below. They satisfy a sweet craving or when I need a little boost. The kids didn't love them unfortunately, but oh well :-). Combine all dry ingredients in a kitchen-aid mixing bowl. Add wet ingredients to dry ingredients and mix until a "dough" forms. Place onto a cookie sheet and refrigerate for at least one hour before serving. 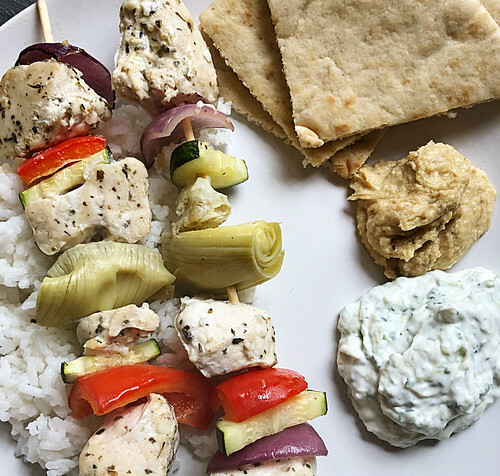 I have really been missing one of my favorite restaurants in Katy where we get the most delicious kebabs so this recipe really caught my eye and I couldn't wait to try it. The homemade Tzatziki sauce was easy to make and so delicious. Since we don't have a grill right now I baked ours in the oven (and also, baked the veggies about 5 minutes extra on their own before adding them to the skewers with the chicken for the rest of the cook time). The marinade for the meat was amazing as well and I have been enjoying the leftovers immensely! Thanks Mel's Kitchen Cafe for the recipe! For the tzatziki sauce, wrap the shredded cucumber in a kitchen towel and squeeze to remove as much water as possible. Mix together the yogurt, shredded cucumber, garlic, red wine vinegar, salt and pepper to taste, and lemon juice. Drizzle lightly with olive oil. Refrigerate for at least 30 minutes before serving to allow the flavors to blend. For the marinade, in a liquid measuring cup or small bowl, whisk together all the marinade ingredients. Place the chicken in a resealable gallon-size ziploc bag (or in a shallow dish) and pour in the marinade. Seal the bag (or cover the dish) and let marinade for 1-2 hours. If using wooden skewers, soak them for 15-20 minutes prior to assembling. Thread the chicken, zucchini, peppers and onion onto skewers. Give the kebabs a little sprinkle with salt and pepper on both sides. Grill over medium to medium-high heat until cooked through, about 2-3 minutes per side. 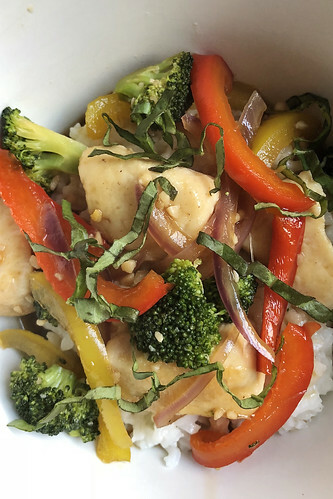 The flavors in this stir fry were amazing! We subbed out the mango for broccoli and loved how it soaked up the delicious sauce. Recipe is from Mel's Kitchen Cafe. In a small bowl or liquid measuring cup, whisk together the broth, soy sauce, 2 teaspoons cornstarch, vinegar, red pepper flakes and sugar until smooth. Set aside. In a medium bowl, toss the chicken with 1 teaspoon salt, 1/2 teaspoon pepper and remaining 3 teaspoons cornstarch. In a large 12-inch nonstick skillet, heat the 2 teaspoons oil over medium heat until hot and rippling. Add the chicken, breaking up any clumps, and cook until it is golden brown on all sides and just barely cooked through (it will cook a few minutes longer later in the recipe). Scrape the chicken onto a plate, keeping as much liquid in the skillet as possible. Add the garlic, mango, bell pepper, and onion and cook for 3-4 minutes, until the vegetables are crisp-tender. Return the chicken and any accumulated juices to the skillet over medium heat. Whisk the sauce quickly before pouring it into the skillet. Cook, stirring constantly, while the sauce simmers and thickens, 1-2 minutes. Season with additional salt and pepper to taste, if needed. Sprinkle with basil and serve over rice, noodles, quinoa or by itself. 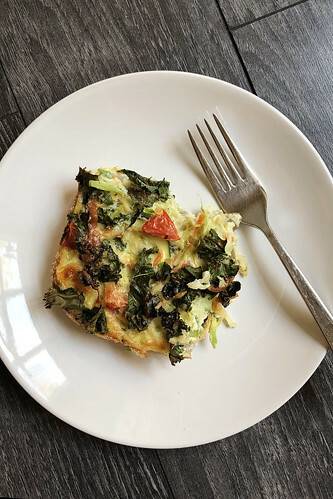 I have made this quiche a multiple times now and love having it on hand all during the week for a quick, healthy and filling breakfast. I found it originally on The Lyons' Share Wellness. She has some great super healthy recipes. Grease or spray 9x13 casserole dish. Chop veggies into bite-sized pieces, and lay in greased dish. In a separate bowl, whisk together eggs, egg whites, and seasoning. Pour egg mixture on top of veggies. Bake 45-50 minutes or until top is browned and middle of casserole has set. Every Christmas Eve my family all gets together for a big meal and my grandfather makes an amazing prime rib. This year was our first to be on our own and making the meal for ourselves. 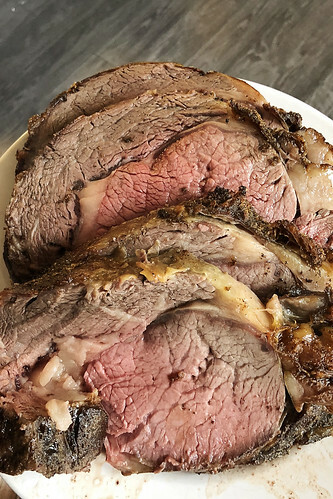 We were quite nervous about ruining the roast, but luckily it turned out great and was actually really simple to do, you just need to allow plenty of time for it to cook. Preheat the oven to 375 degrees F. Combine the salt, pepper and garlic powder in a small cup. Place the roast on a rack in a roasting pan so that the fatty side is up and the rib side is on the bottom. Rub the seasoning onto the roast. Roast for 1 hour in the preheated oven. Turn the oven off and the leave the roast inside. DO NOT open the door. Leave it in for 3 more hours. 30-40 minutes before serving, turn the oven back on at the 375 degrees F to reheat the roast. The internal temperature should be at least 145 degrees F.